There are things out there all around us that we often miss because we’re just not looking. This is perhaps most true in the tech world, where thousands of secrets are out there in the wild, hidden in code. If you know where to look, or if you can read the code, you can find those secrets. It’s how so many features of iOS get revealed early by sites like 9to5 Mac, who are great at parsing the code (and confirming our non-code-digging scoops). It’s how we knew basically everything about Chrome OS before it actually launched. It’s how we knew Facebook Places was coming before it was announced. And now we’ve just uncovered a new massive find this way. Hidden in the code of Facebook’s iPhone app is the code for something else. Something everyone has been waiting over a year for. The iPad app. 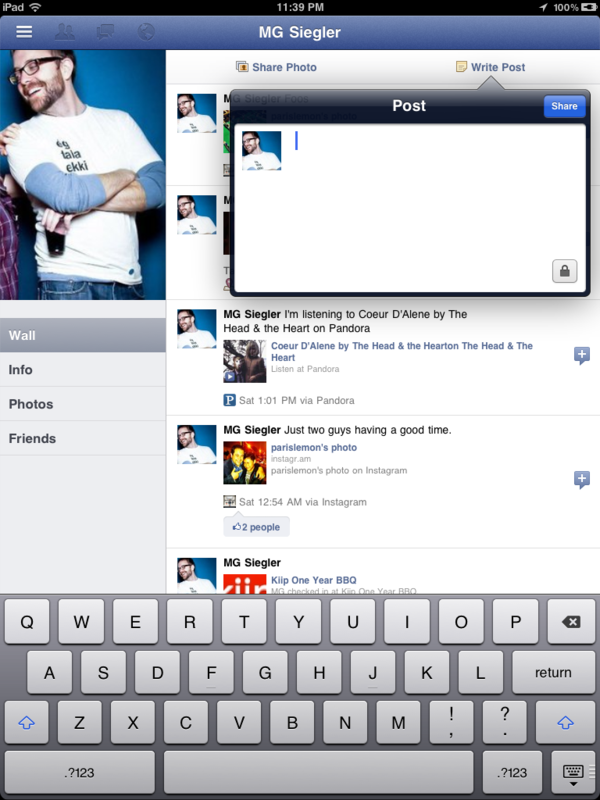 For the past couple hours, I’ve been using Facebook’s iPad app. Well, I should qualify this. I can’t be sure if this is the version they’ll actually ship, but based on everything I’ve seen, I’m going to assume it’s at least very close to the version they’re going to ship. While much of it is written with HTML5 (as you might expect from Facebook), the native iPad work is very good too. In particular, the navigation system is great. Unlike the iPhone app — which even its creator is complaining about now as being stale — the Facebook iPad app uses a left-side menu system that can be accessed by the touch of a button or the flick of the iPad screen. The app also makes great use of the pop-overs (overlay menus) found in other iPad apps. When you flip the iPad horizontally, the list of your online friends appears and you can chat with them as you do other things on Facebook. The photo-viewer aspect looks great — similar to the iPad’s own native Photos app. Places exists with a nice big map to show you all your friends around you. Etc. It’s all good. I’m going to put up a post after this one with a ton of screenshots of the entire app. All of this is possible apparently thanks to a seemingly tiny update Facebook pushed yesterday to their iPhone app. Version 3.4.4 seemed like a small version that restored the “Send” button for comments and chat among a few other little things. Facebook may have even pushed it out in response to some backlash they had been getting about the app, as Financial Times covered a few days ago. Perhaps it was the rush to fix some of those issues that caused Facebook to push this version — which will clearly eventually be Universal Binary (meaning it will house both the iPhone and iPad versions of the app) — with the iPad elements inside. Whatever the case, the app is carrying a payload of much greater importance than some bug fixes. So, I’m using it. Can you? Well, yes — if you don’t mind doing some things you’re technically not supposed to do to your iPad. We obviously don’t recommend it, but if you catch my drift, I’m sure you can figure out a way to access Facebook for iPad. Related, it must be noted that a Canadian engineering student, Marvin Bernal, who calls himself an “iOS Enthusiast” actually noticed this Facebook mistake almost immediately and tweeted about it. So, after over a year of complaints, Facebook now appears to truly be on the verge of releasing the iPad app. It has now been well over a month since the New York Times’ Nick Bilton reported about the app’s existence and said it should launch in the “coming weeks”. At the time, we further verified its existence , but did not hear a timetable for the launch. Once source now says that based on the HTML changes rolling out on an hourly basis, it looks like work is still underway. But much of that work appears to be smaller tweaks at this point. We’re close — just in case the code being attached to the iPhone app didn’t give that away. During the launch of the Skype video chatting integration a few weeks ago, Facebook CEO Mark Zuckerberg noted that the company was gearing up for a full slate of launches in the coming weeks. The iPad app will be one of them. And based on what I’ve seen tonight, I’d be even less surprised if Project Spartan ties in with it as well eventually. The one thing the iPad app (like all the other Facebook mobile apps) is missing is gaming (and all other third-party apps). Spartan could bring that down the line. We’ll be doing a post with a ton of images shortly. Below, a quick taste. Update: And all the images. Enjoy. Update 2: I’ve confirmed with a source who had previously seen the Facebook iPad app that this is in fact the very app that they were planning to launch with. We’ll see if that timetable gets sped up now.